You'll want to try this grilled stuffed zucchini recipe if you're looking for a change of pace with your veggie side dishes. One of the more unique grilled zucchini recipes, this one is stuffed with a Maple and curry infused sausage, apple and Philadelphia cream cheese blend. 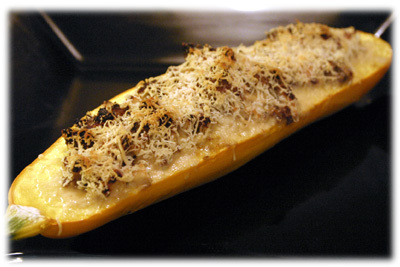 Split the zucchini lengthwise in half, scoop out the seeds, spoon in the stuffing and cook on the grill for 20 minutes. Depending on the size of the zucchini this can be served either as a side dish or a stand-alone meal. The one pictured below was quite large and was enough on it's own for two people. 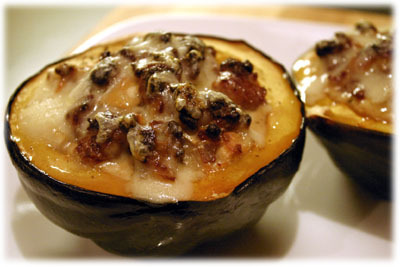 I've recently modified the stuffing ingredients for this particular zucchini recipe once I added this Stuffed Acorn Squash recipe. 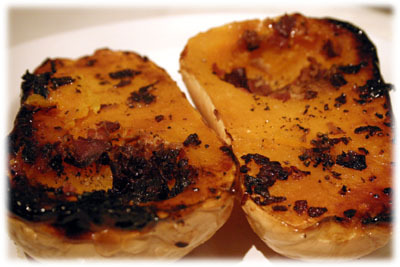 I changed some of the ingredient proportions and added crumbled crispy cooked bacon. 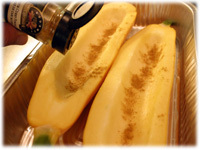 Zucchinis' are perfect for the grill and you can use either the green or yellow variety. 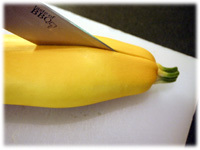 Considered a Summer Squash, it's more delicate then the Winter Squash varieties like Butternut or the Acorn. With this stuffed zucchini recipe you can eat the entire vegetable, skin and all. 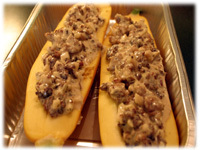 Variation: Try honey-maple sausage in this stuffed zucchini recipe if you can find it. Break up and saute the sausage meat until browned. If you're not using bulk sausage make sure to remove the casings and then break the meat into small clumps in the skillet. As the meat is cooking sprinkle 1 teaspoon black pepper over the meat. Add the crispy cooked bacon crumbles to the meat. 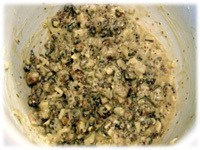 After cooking remove the sausage meat, drain the grease reserving 1 tablespoon and set aside. Sautee the shallot, apple and garlic in the reserved sausage grease. 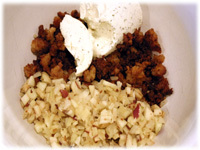 In a large mixing bowl combine the cooked sausage and bacon mixture with the cooked apple and onion mixture. Add the cream cheese, maple syrup and mix well to melt the cheese and blend. If the sausage has cooled put the bowl in a microwave for 30 seconds to melt everything together. Split the zucchini in half lengthwise. Use a spoon to scoop the seeds and pulp from the center of the zucchini pieces. Place both pieces into an aluminum pan large enough to hold them. Sprinkle the salt, pepper and curry powder on both pieces of zucchini in the scooped out area. Spoon the sausage mixture into the scooped out area's of the zucchini. Press it in slightly as you add it - don't worry about mounding it up a little higher then the zucchini. 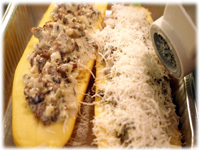 Grate fresh Parmesan (or other shredded cheese) over top of each stuffed zucchini. 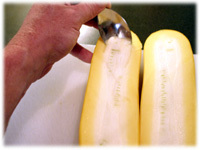 Tip: I find the Parmesan has great flavor but doesn't melt as well as other softer cheeses. Putting it on now works well. If you're looking for a more melted cheese effect, wait until the last 5 minutes of cooking and use slices of Swiss cheese instead. 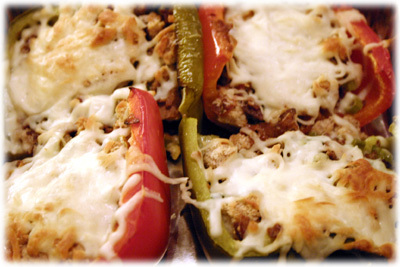 It melts quickly and doesn't add an overpowering flavor. Prepare the grill for Indirect cooking and preheat to 500F - 525F. 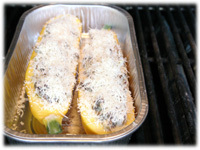 When the BBQ reaches temperature place the aluminum pan with the stuffed zucchini on the grates away from the direct heat. Check in about 15 minutes to make sure it's cooking and the cheese is melting and beginning to brown. 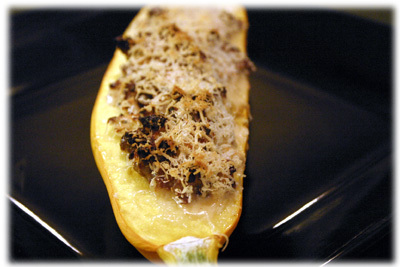 When cooked remove the stuffed zucchini from the grill and serve immediately.